Rhubarb is actually a vegetable, not a fruit. We usually treat it as a fruit, because of its high acidity, but some cultures do use it as a vegetable in savoury dishes, so don’t be entirely surprised if you come across such recipes. The leaves are extremely poisonous. They contain in abundance a toxic amount of oxalic acid, which causes cramps, nausea, and often, death. Apparently, someone in living memory has actually tasted them and lived, so we know that they don’t taste very good anyway (they are very bitter.) Don’t let the leaves put you off rhubarb, though: potato and tomato leaves would kill you, too. We mostly use rhubarb for desserts, in pies, puddings and stewed sweet sauces. Don’t feel, however, that you can only use that sauce on your cheesecake: rhubarb sauce is also really amazing with pork, lamb and pâtés. You can also make rhubarb chutney, flavoured with ginger, orange zest, brown sugar, and sultanas. Rhubarb jam makes a good filling for layer cakes and cookies. You can also roast it in chunks, accompanying root veg such as carrots and parsnips. Rhubarb always needs to be sweetened, but be careful not to go overboard — part of the appeal of rhubarb should be its underlying tartness. Strawberries are the usual favourite fruit to mix with rhubarb. Rhubarb also goes great with raspberries, currants, black berries, apricots and peaches. But just as with sweetening it, it’s easy to overwhelm the flavour of the rhubarb with other fruit. The bright-red stalk rhubarb is the one that we are most familiar with (called by monikers which are variations of “Crimson” or “Cherry”, depending on where you live.) It has the tartest stalks. 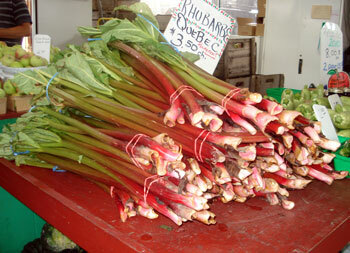 Rhubarb can also be bought with pink, light-red, green or white stalks (see entry for Champagne Rhubarb.) The redder the stalk, the more sour it will be. Hothouse rhubarb, the kind you mostly see in stores during the winter, will have lighter-coloured stalks, be less sour and be less stringy than garden or field rhubarb. When buying rhubarb, pick firm stalks; avoid limp ones that are on their way out. As with many things in life, firmness can be a better indication of quality than size. Opinions as to whether you can harvest in the fall — because the stalks would die anyway — vary. The USDA says you can. They say, “Select young, tender, well-colored stalks from the spring or late fall crop.”  Rhubarb – Stewed. United States Department of Agriculture (USDA). Complete guide to home canning. Agriculture information bulletin No. 539. 2009. Page 2-22.. Some bloggers suggest that if you do, leave 2/3’s of the stalks. Many people feel that it’s fine to take a few stalks now and then during the course of the summer and fall, especially if the leaves on them are going to be overshading something else in the garden that needs the sun to be productive. These occasional stalks can be washed, chopped, and frozen in the freezer until enough have accumulated to do something with. Don’t allow flower stalks to form, as that will weaken next year’s crop. Remove them and discard; don’t consume. “Do the rhubarb stalks become poisonous by summer? It is generally recommended that home gardeners stop harvesting rhubarb in early to mid-June. Continued harvest through the summer months would weaken the plants and reduce the yield and quality of next year’s crop. The rhubarb stalks may become somewhat woody by mid-summer, but they don’t become poisonous.” Ibid. Source: FDA. Approximate pH of Foods and Food Products. April 2007. Accessed March 2015. Wash the stalks, rubbing with your finger where any dirt has adhered. Trim off the ends. If it is very stringy, pull out the strings. Cut stalk into pieces anywhere from 2.5 to 5 cm (1 to 2 inches), and use as per your recipe. Because rhubarb is so acidic, don’t cook in an aluminum pot. Raw rhubarb contains a lot of water in it; generally, you don’t need to add any when cooking it. Just tightly cover the pot you are cooking it in over a low heat until it releases all its juices, then you can raise the heat a bit, remove the lid and cook a while longer. In a pressure cooker, put in steamer basket over 250 ml (1 cup / 8 oz) of water and cook on low pressure for 4 minutes. After cooking, scoop it out of the basket into a bowl and stir your sweetener in to taste. Using sugar: if you can weigh the rhubarb, you will likely need to add sugar to the pot equalling at least 1/4 of the weight of the Rhubarb you are cooking up. Instead of sugar, try a few drops of liquid stevia. No one will taste the difference, and it will save you a lot of unnecessary calories. If your rhubarb is the red stalk variety, you can always stir a few drops of red food colouring to it after cooking to deepen the colour. Try other tart fruit such as cranberries or quince. Rhubarb leaves are seriously poisonous because they contain very high amounts of Oxalic Acid. Always discard the leaves. Refrigerate wrapped in plastic or in a plastic bag for up to 5 days. To freeze, wash it, chop into 2 to 5 cm (1 to 2 inch) pieces, toss in freezer bag, and freeze for up to a year. The Chinese were growing rhubarb in 3000 BC for what they thought were its medicinal properties in treating headaches and fevers. It was brought to Europe and cultivated there for its purgative abilities. The English first tried using it as food, rather than medicine, in the 1600s. Unfortunately, the brave pioneers of the kitchen focussed on cooking and eating the leaves, which didn’t do anything to popularize the plant as a staple in the kitchen. Rhubarb appeared in America sometime after the revolution, again, being raised for medicinal properties. No one seems to have even thought of eating the stalks until the 1800s. You need copious amounts of sweetener to make something from the tart stems, and sugar had been a very expensive commodity up until then (they had honey of course, but honey wasn’t much cheaper.) The Victorians really got the hang of cooking with rhubarb, and valued it as an early-season “fruit” that was available when nothing else had even really started to grow yet. But even in the first bit of the 1900s, for some reason we just hadn’t fully given up on the leaves. During WW1, Americans were encouraged to eat rhubarb leaves as a supplement to fresh vegetables, which added a few home front casualties to the overall toll of the war. Grigson, Sophie. My resistance to rhubarb crumbles. London: The Independent. 19 February 1994. Adams, Stephen. Delia Smith causes rhubarb shortage. London: Daily Telegraph. 4 April 2010. 2. ↑ Rhubarb – Stewed. United States Department of Agriculture (USDA). Complete guide to home canning. Agriculture information bulletin No. 539. 2009. Page 2-22.